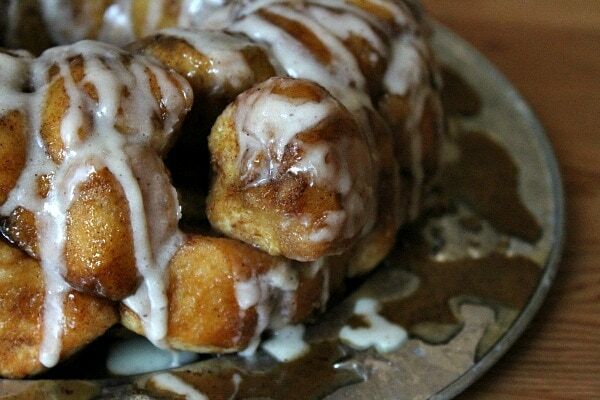 It’s your typical pull-apart monkey bread infused with butter and spiced brown sugar, then drizzled with eggnog glaze. Dreamy, isn’t it? Here’s a peek at how you make it: Using a stand-mixer is easiest (but you can certainly knead by hand if you’ve got the energy). Let the dough hook do all of the mixing and kneading for you, then plop the dough into a bowl and let it rise in a warm place. My secret place for letting bread rise is my oven. I turn it on 400 for one minute only, then turn it off. Then I turn on the oven light, set my bowl of bread dough on the oven rack, cover it with a towel, and let it rise. It makes a cozy place for rising, but you have to make sure that you turn the oven OFF! The risen dough is transferred to a floured surface. Roll the dough out into a square. Cut the square into fourths. Cut each fourth into sixteen pieces. How many pieces do you have now? There’s your math lesson for today 😉 By the way… easiest way to do this: use a bench scraper. 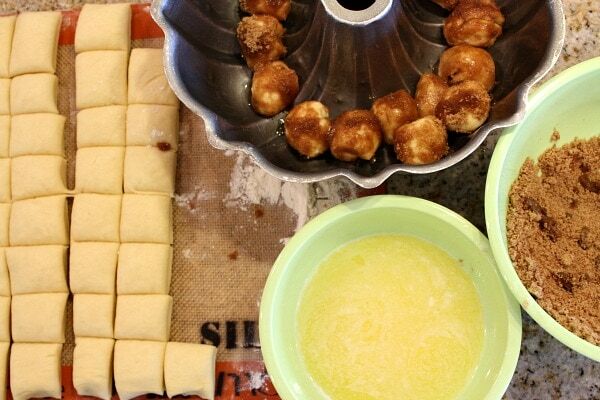 Roll each piece of dough into a ball, dip it in melted butter, then dip it into the spiced sugar and set it into your bundt pan. Then do that 63 more times! … where it will look like this. Goo and all. After a small amount of cooling time, if you dare to add the eggnog glaze on top, this is when that happens. Oh la la. Be-still my heart. Would you look at that! Me oh my. I’m going to the gym. Wait, no I’m not. Dig in! Just pull apart and nibble. It’s best while it’s still warm, but if you warm it up later it won’t taste so bad either. This one takes a little bit of heart and soul, but you know it’ll be worth it in the end, right? 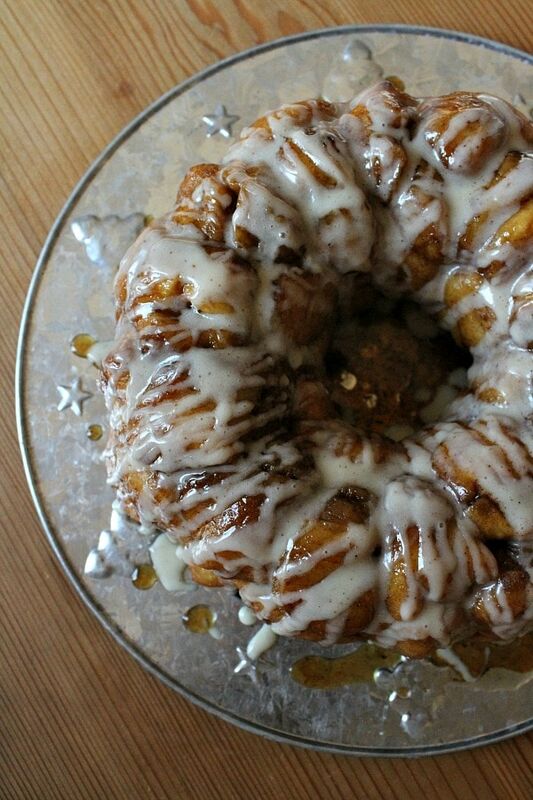 This Monkey Bread will give you a hint of eggnog flavor...it's not overwhelming. 1. Prepare the dough: Heat the eggnog and butter in a glass cup in the microwave until the butter is melted (you can also heat these in a pan on the stove, if desired). Cool to 110 to 115 degrees F (about as warm as you'd like a bath to be- if you don't have a thermometer). In the bowl of a stand mixer, combine the warmed eggnog mixture with the yeast. Let sit for a minute or two, then add the egg, 2 cups of flour, salt and nutmeg. Use the dough hook of your mixer to combine the ingredients. Add remaining flour (up to 3 cups), 1/2 cup at a time while the dough hook is stirring. Stop the mixer to scrape down the sides of the bowl, as needed. The dough hook should be pulling the dough up out of the bowl and away from the sides. If it's still too sticky, add additional flour by the tablespoon until you get the desired consistency. Let the dough hook knead the dough for 5 minutes. Turn the dough onto a lightly floured surface and work with your hands a little bit to form a smooth, round ball. Coat a large bowl with nonstick spray. Place dough in the bowl and turn it over to coat with the spray. Cover the bowl with a clean dish towel. 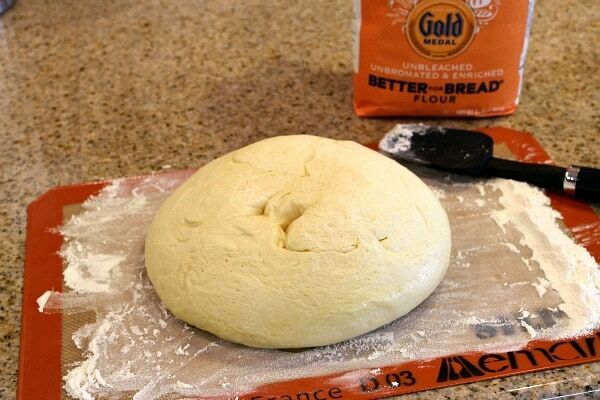 Place it in a warm place to rise until the dough doubles in size- about 1 hour (see tips below). 2. Prepare the Ooey Gooey stuff: In a medium bowl, whisk together the brown sugar, cinnamon and nutmeg. Place the melted butter in a separate bowl. 3. 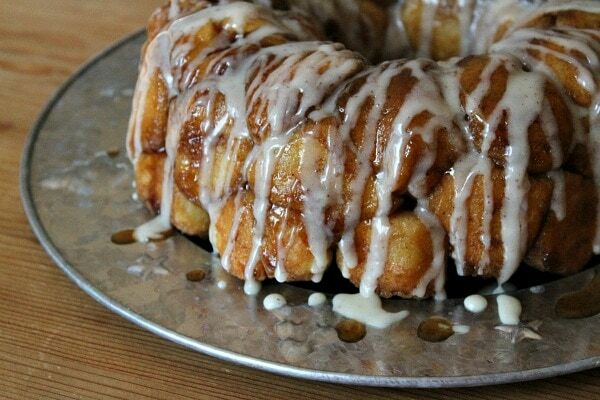 Form the bread balls: Spray a bundt pan with nonstick spray. Remove the dough from the bowl onto a lightly floured surface and gently pat it into an 8-inch square. Using a sharp knife or a bench scraper, cut the dough into 64 pieces (cut the square into 4 pieces, then cut each piece into 16 pieces). Roll each small piece into a ball. 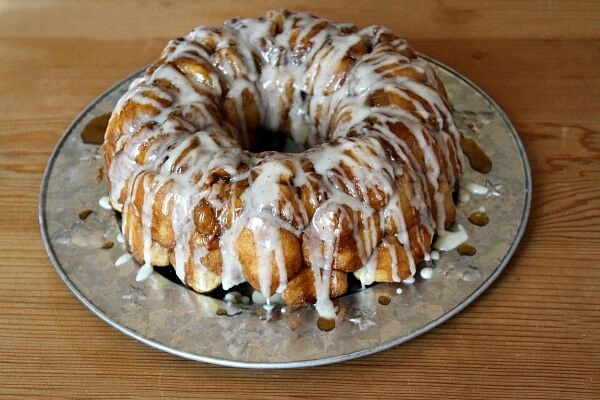 Dip a ball in the melted butter, then roll in the brown sugar mixture; place it into the bundt pan. Continue with the remaining 63 pieces of dough, layering the balls as they accumulate in the bundt pan. If you have any melted butter left over, drizzle a couple of tablespoons over the layered dough balls. Cover the bundt pan with a clean dish towel, and place it back into a warm place to rise for about another hour. They should get slightly puffier. 4. Ready to bake: Preheat your oven to 350 degrees F. (if you're using the oven as a warming place, take out the bundt pan before you preheat the oven!) Remove the dishtowel. Bake about 30 minutes, or until the top has browned and ooey gooey caramel is bubbling around the edges. 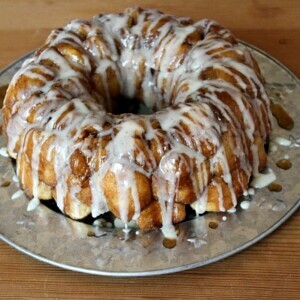 Cool in the pan for 2 to 3 minutes, then flip the bundt pan upside down onto a platter to remove the contents of the pan. Let it sit on the platter for a few minutes to cool slightly before glazing. 5. Prepare the glaze: Whisk together the powdered sugar, eggnog and nutmeg. 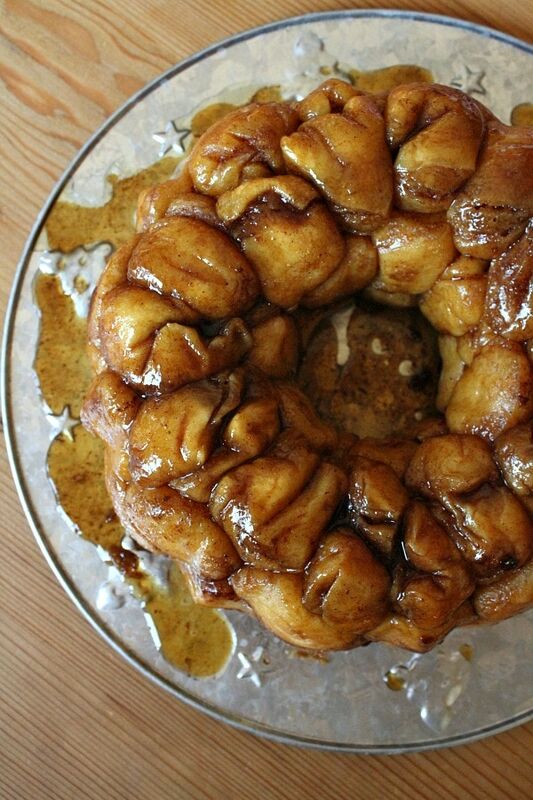 Spoon the glaze over the top and sides of the monkey bread. Serve warm- it's ready to pull-apart and eat! *You can certainly mix and knead the dough by hand- it'll just take some arm strength to get the job done! *My favorite place for rising bread dough is in my (cold) oven. You can make a cold oven a slightly warm place by turning on the oven to 400 degrees F. and letting it warm up for ONE MINUTE ONLY. Then TURN IT OFF. Turn ON the oven light. Now you've got a warm place for rising. MAKE SURE THE OVEN IS TURNED OFF THOUGH! Disclosure: I’m working with Gold Medal Flour to create seasonal recipes for the next couple of months. This is one of those goodies. All opinions shared are my own.